The 2002 rerelease of E.T., which marks 20 years since the film's 1982 debut, includes never before seen footage, enhanced visual effects, and a new remastered soundtrack. E.T. 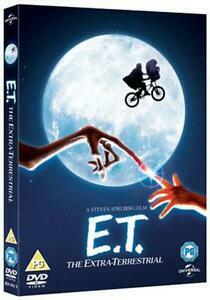 THE EXTRA-TERRESTRIAL is Steven Spielberg's warmhearted classic delight for both children and adults. It tells the story of an alien creature, E.T., mistakenly left behind on Earth. When a young boy, Elliott (Henry Thomas), finds E.T. and hides him in his home, both their worlds are changed forever. E.T. teaches Elliott and his two siblings (Drew Barrymore and Robert MacNaughton), whose parents have recently separated, about caring and love while the children protect E.T. from the malevolent world of grown-ups. Elliott and E.T. become so close that they share emotions; as E.T. becomes ill, so does Elliott. The children end up going on a fabulous adventure trying to help E.T. find a way back to his home planet. The movie was originally going to be based on a story idea by director John Sayles, but after he removed himself from the project, screenwriter Melissa Mathison (Harrison Ford's former wife) took over the script and made it her own. John Williams's beautiful soundtrack became forever linked to E.T. THE EXTRA-TERRESTRIAL. Er zijn 135 objecten beschikbaar. Voer een getal in dat minder is dan of gelijk is aan 135.